Sonny Boy Spiritual Products and faith help with Steady Work, Fast Success, and Buddha's Wish. 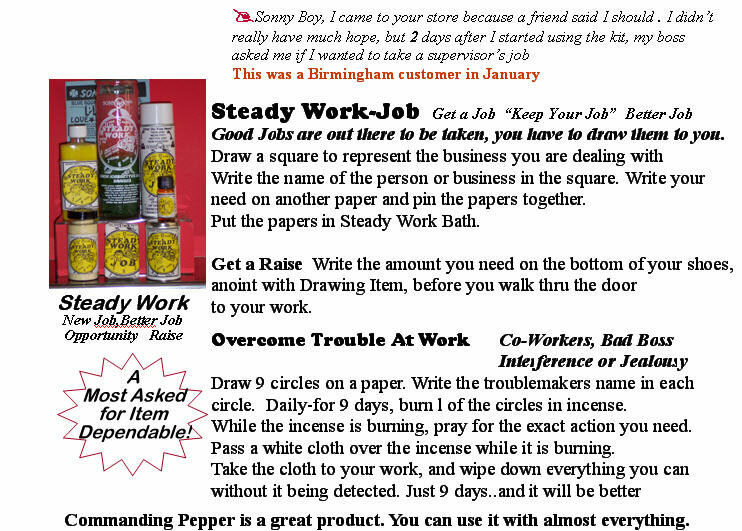 Get your Lucky Mojo Drawing Power to Work! SONNY BOY® Steady Work Job - Sonny Boy spiritual and religious oils, incense, bath wash, salt crystals, sand, bar soap, spray and spiritual faith candles. Steady Work-Job! Get a Job! "Keep Your Job" Better Job! Good Jobs are out there to be taken, you have to draw them to you. Draw a square to represent the business you are dealing with. Write the name of the person or business in the square. Write your need on another paper and pin the papers together. Put the papers in Steady Work Bath. Get a Raise. Write the amount you need on the bottom of your shoes, anoint with Drawing Item, before you walk thru the door to your work. Write the amount on a pay stub 7 times. Anoint with Steady Work and Money Spray. Keep this paper pinned inside your clothing. Touch the paper several times daily. Overcome Trouble At Work,	Co-Workers, Bad Boss, Interference or Jealousy. Draw 9 circles on a paper. Write the troublemakers name in each circle. Daily-for 9 days, burn l of the circles in incense. While the incense is burning, pray for the exact action you need. Pass a white cloth over the incense while it is burning. Take the cloth to your work, and wipe down everything you can without it being detected. Just 9 days and it will be better. SONNY BOY says, always use a kit for strongest action. SONNY BOY® All Purpose Drawing - Sonny Boy spiritual and religious oils, incense, bath wash, salt crystals, sand, bar soap, spray and spiritual faith candles. Drawing Love! Money! Success! All Purpose Drawing Action. Better Life-Better Things! Keep a Steady Stream of Blessings. Pray over your DRAWING Candle at sunrise and sunset. Make your request while facing out a window. Use the DRAWING KIT for a week, and if you don't see the results you need. SONNY BOY says, always use a kit for strongest action. SONNY BOY® Buddha Make Your Wish, Draw Your Desire - Sonny Boy spiritual and religious oils, incense, bath wash, salt crystals, sand, bar soap, spray and spiritual faith candles. Buddha Make Your Wish, Draw Any Desire Unbeatable! Use this powerful drawer with any item such as Love, Money, Success, Job, Special Position, or Favor. Daily - Anoint yourself and an image of your desire, whether a picture or a paper on which is written your desire. Use a white cloth, which has been anointed to bless your home or car or workplace. Always keep a DRAWING POWER working. We must have hope for our dreams and desires. Sonny Boy says, "Keep a Buddha in your home, facing your door." SONNY BOY says, always use a kit for strongest action. 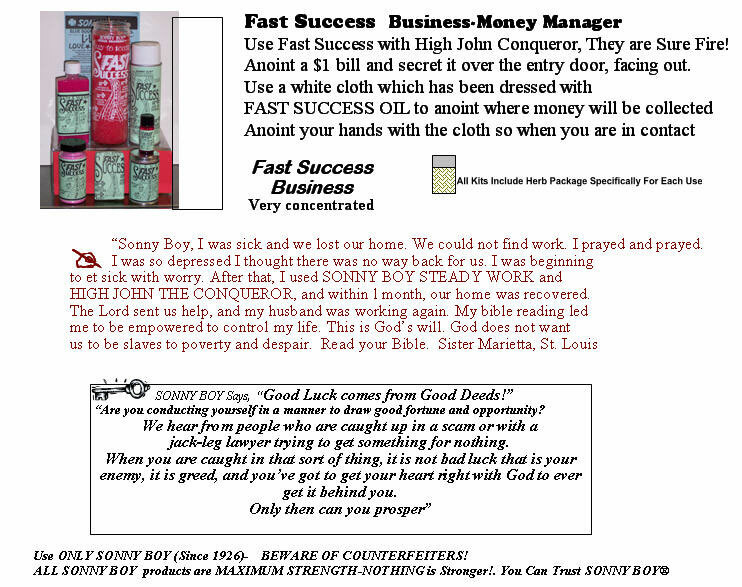 SONNY BOY® Fast Succcess Better Business - Sonny Boy spiritual and religious oils, incense, bath wash, salt crystals, sand, bar soap, spray and spiritual faith candles. Fast Success! Business-Money Manager! Use Fast Success with High John Conqueror. They are Sure Fire! Anoint a $1 bill and secret it over the entry door, facing out. Use a white cloth which has been dressed with FAST SUCCESS OIL to anoint where money will be collected. Anoint your hands with the cloth so when you are in contact with other people, you can draw your needs from them. Wipe the outside of your door each morning. Protect yourself with Jinx Remover. Fast Success Business. Very concentrated. SONNY BOY says, always use a kit for strongest action. Sonny Boy Spiritual Products draw opportunity for your Job. You need Steady Work. You need Raise in Pay. You need Fair working conditions, a Fair Boss. You need a Better Position. You need a Better Job. You need Success in your Work, and in your personal endeavors. Sonny Boy Buddha products can draw your personal wishes. You can be successful. Burn Sonny Boy Novena Candles, use the incense and oils and other items in the kits. You will draw the blessings you need.